I’ve gone over customization options,achievements, and the intensive Eidolon system, but the most important element of Aura Kingdom remains: Gameplay. If the gameplay is awful, nothing else matters after all. Thankfully XLegend isn’t new to game design and has learned their share of lessons from past mistakes and successes. Granted this has the downside that they tend to not edge too far from their comfort zone with each successive title. But there’s enough of a technology gap as well as title gap (games either not released in the US or published under other publishers) that anyone who enjoyed Grand Fantasia or Eden Eternal will be in for a good time here. Leading up to finally testing Aura Kingdom, I would often ask my contacts at Aeria if this game would fall into the category of ‘action combat MMORPG’ akin to legitimate titles carrying that name like Dragon Nest and TERA. At this I would usually get a wishy washy answer along the lines of ‘sort-of.’ This bugged me to no end but now that I’ve actually tried the title, I can better understand the logic behind it. While a large majority of attacks are point, click, auto-move into range, channel, and attack, there are still quite a number of skills that will activate on the spot whether you are in range to use them effectively or not. This might involve placing a turret on the ground, unleashing an explosion of energy in a circle around you, launching a slow moving projectile in a straight line, or flipping like a living buzz saw forward at any enemies present. While there are no active dodge skills, a number of skills won’t break the channeling time from moving, and some even offer advanced movement capabilities while using them, essentially turning these skills into dodge skills. 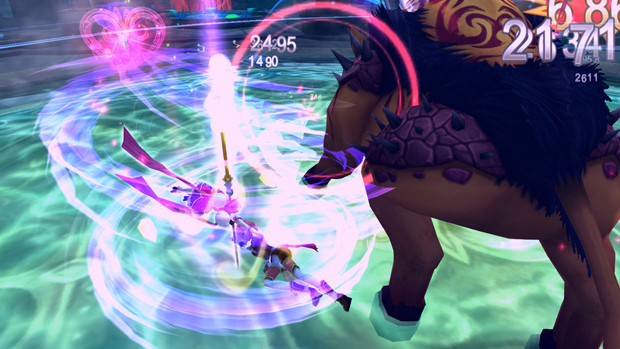 Enemies in addition offer obvious red tales that have been made rather famous lately by promotional WildStar videos. Most boss monsters you’ll face as a result have 100% dodgable special attacks forcing players to remain mobile and active. 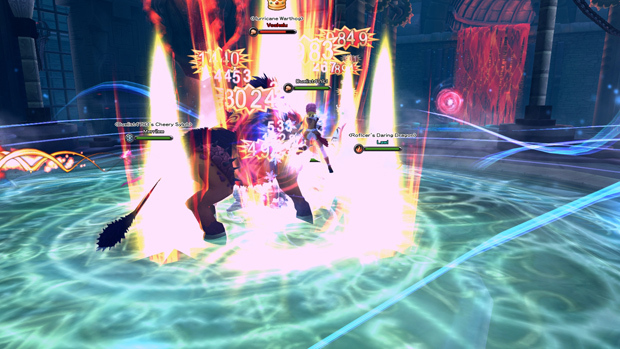 In addition, players can deal bonus damage by coordinating with their tank to keep the dps classes behind the boss. All in all the result is a game that classic MMORPG players can relate to but is not something that you can lazily macro your way through with one hand, unless you’re that one jerk with epic fairy wings and overpowered armor that likes making your healer’s life difficult. Yes we’re talking about you, All-Powerful Pippers. My biggest issue with the fluidity may actually be the spam happy nature created by it being too fluid. Sure that might sound like a strange complaint but you are going to have to play your keyboard like a piano at end-game to maximize your damage and this is something anyone with ping issues is going to find a rough feat to accomplish. Cooldowns are short (and only get shorter thanks to the option of putting offensive points into speed) and there is no resource bar limiting most of your attacks outside of said cool-downs, to the point that you will always be planning three steps ahead. 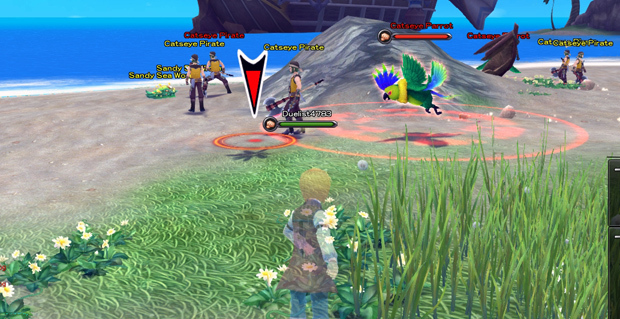 Again this is another way Aura Kingdom cleverly implements an action combat feel without the actual physics engine strains typically associated with it. One final mention on the fluidity of combat is the feedback offered by powerful skills. Though I wouldn’t say it’s terribly hard to dodge most boss attacks, on the off chance that you fail to you are going to know it. While running a particular three player dungeon designed to be a farming instance for gathering Eidolon fragments, our novice group was repeatedly blown halfway across a huge arena for not dodging said attacks. 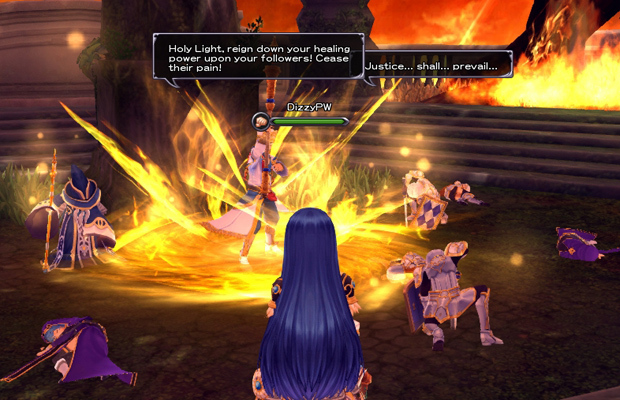 It’s so over the top it’s silly at times but given the Anime nature of the game, it flows quite well. Also gliding is awesome. Try it for yourself. You can’t explain how awesome it is till you’re soaring around mindlessly taking in the beautiful landscapes present throughout the game. I won’t comment too much on this as it would be silly to think someone with only four hours of experience could go into great detail on overall class balance. But I will say between the chaotic graphical overload that occurs during a battle, your constant piano string of hotkeys, and keeping an eye on the health and efficiency of your Eidolon, I don’t see players having time to worry about if they are doing x less damage than player y. With the crazy amounts of upgrading you can do to your character through soul stones and other armor upgrades, to your Eidolon through evolution and special food boosts, and to your skill set through mix and matching various dual weapon combos, the thought of the game being perfectly balanced goes out the window. But since the game is primarily focused on PvE with PvP as a seeming diversion still be trialed and tested at end-game, that isn’t a huge deal to me. Maybe it’s the casual nature I’ve taken to gaming as I’ve gotten older but I was content just enjoying the pretty explosions and epic loots while feeling all warm and fuzzy that my Eidolon loves me for slaughtering pretty fairy girls. 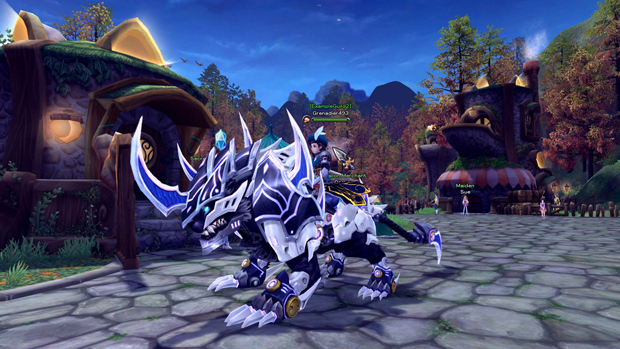 One of the primary complaints I’ve seen from players that got involved with the initial release of Aura Kingdom (Final Frontier) in Taiwan was that the game’s leveling curve allowed players to reach end-game too fast (resulting in empty lower tier maps quickly) and that the end-game itself was not challenging enough (as player power grew so fast it outscaled the monsters, making skill less important). 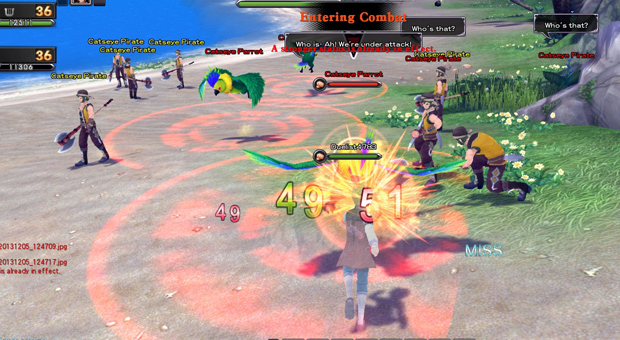 From what I’ve tested, Aeria’s localized version has addressed this by upping the challenge of the monsters to better test their playerbase and keep them actively dodging and reacting to their opponents to keep that action combat feel alive and well. There have been a series of quests added as well that break up the monotony of kill X and gather Y by putting players in scenarios requiring wit rather than gear level. One such scenario set you on a beach as a rogue trying to sneak past a band of scallywag pirates and their oversized stealth detecting parrots. It played out much like stealth missions in older console games (remember Zelda’s courtyard in Ocarina of Time?) and was sufficiently punishing when I allowed a parrot to catch me to see what would happen. Another instance saw me redeeming the honor of an inventor who wiles his time away building battle bots. This mode pit me against various creatures and inventions leading up to the championship battle bot match and offered gameplay mechanics along the lines of a rock, paper, scissors, band-aid match… if said match wasn’t turn-based and both combatants moved simultaneously. It was challenging (I never lost but the final boss did knock me down to 1,500 of my 8,500 HP) and more importantly, it was fun and engaging. 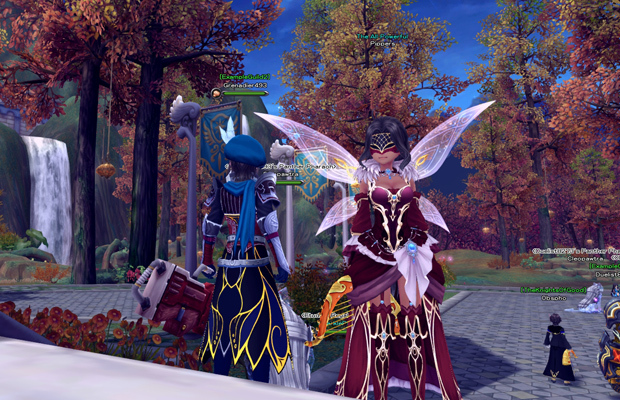 It’s clear in a game catering to the typical Anime MMORPG audience that focus on community building is key. It’s the real end-game that keeps players coming back for more, having crazy romances, and building guild empires to shake the foundations of the servers. I’m happy to say that while limited and still very much in development, the foundations are clearly there to make sure Aura Kingdom meets these expectations. 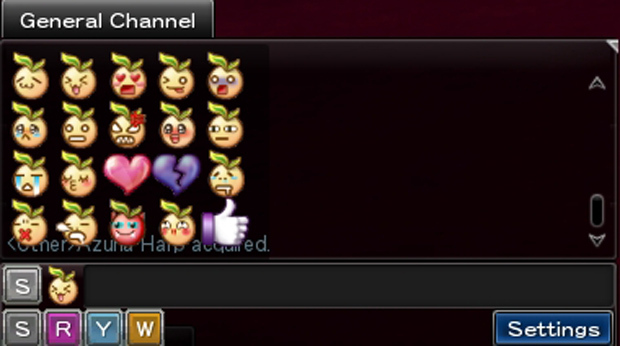 The chat box features twenty emoticons, and I found around 12 physical character emotes that seemed to vary between gender. Guilds are also in with all the major social functions you’d expect including customizable rank, privilege assignment, guild halls (very much a work in progress as they aren’t customizable yet), auction houses, community storage, and specialty shops. 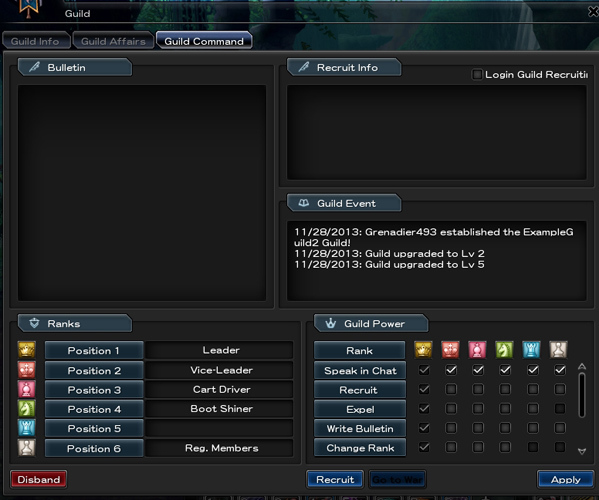 Guilds can also be leveled to unlock guild bonuses to help build pride in your faction for all your hard work. Typically guild leveling is based off of daily quests and actions players would normally do in their standard session of play so potential guild leaders don’t need to fret about cracking the whip on their members (minions) to see progress. Just recruiting active people is enough to make things happen. One hit to the social functionality I will mention is that crafting seems to be non-existent. Unfortunately it slipped my mind to question Aeria if this was something in development or not, but there are some odd mini-games such a fishing on the way that partially fill this void. It’s still too soon to offer a concrete rating on the game but what I experienced, I enjoyed, and what I wanted to see included seemed to already be in development and testing. I ended up spending the majority of my time testing out mechanics so I’m not quite up to snuff on the lore but it sounds like a decent romp between angelic and demonic realms fighting for control of the rare resources in the human world. 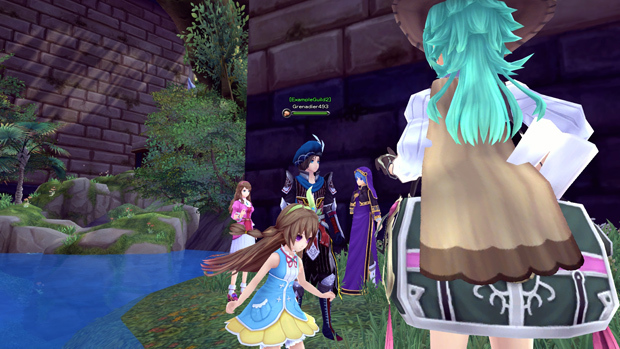 The game is still a few months away from developing into an excellent title but there’s enough fun to be had here to ensure Aura Kingdom will be profitable enough to build into a AAA tier Anime MMORPG title. But as always, Anime MMORPGs are best enjoyed in a social setting so grab some friends or make new ones on the active and enthusiastic Aeria forum and brace yourself, as beta is barely over a week away for founders and likely won’t be too much longer after for people lucky enough to snag a beta key. And on that note, now is your chance to enter to win our Early Access Grand Prize, a Platinum Founder’s Pack! Head to our forums and answer our final trivia question to be entered into our drawing for this prize! A new champion profile for Infinite Crisis has been released today, featuring Shazam! Following the inaugural Mobile Masters event in New York, Amazon continues to support and lead the way for mobile gaming. 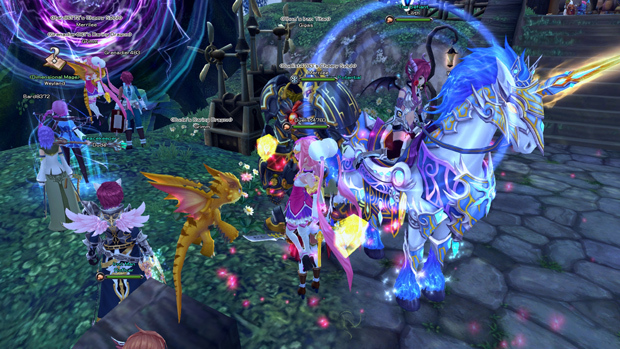 MMOHuts Weekly Recap #126 March 3rd - Age of Wushu, Maple Story, Prius Online & More!